This is an all-ages, no-experience-required, everybody-welcome! dance class that Peggy can lead while in residence in your community. She begins the class with a basic warm-up, then teaches the participants a few phrases of movement from the piece of her choreography that is touring. 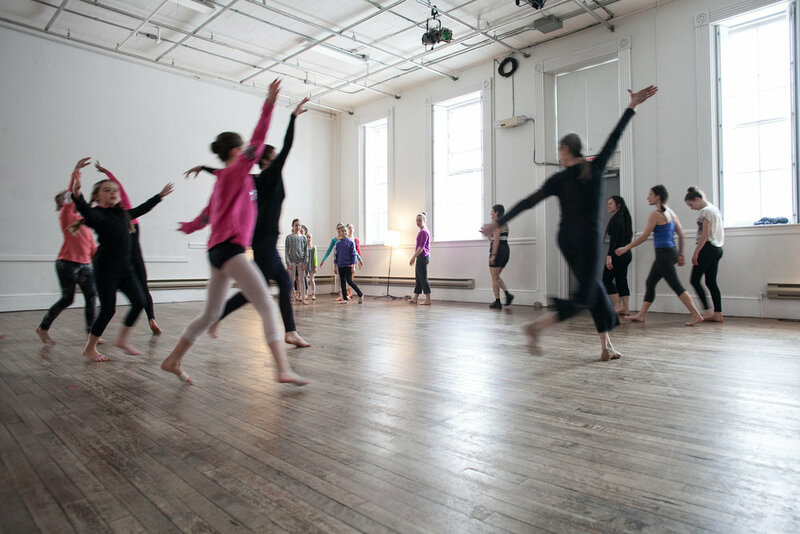 At the end of the class, members of the company perform the material in a longer, larger section of choreography, enabling the participants to see what they’ve just learned in the context of the dance piece. The class succeeds in welcoming people inside modern choreography, and deepens their appreciation for the artistry and athleticism of contemporary dancers. In Toronto, we offer Modern Moves made easy at 11am, followed by a light lunch, so that the participants and Peggy can relax and reflect on the class together. To discuss Peggy teaching in your community, please contact Meredith Potter . Modern Moves made easy, Fredricton, 2014. Photography by Gary Weekes.